See below for a comprehensive list of ways to assist persons in your congregation who have disabilities. In his article, “Gospel Accountability: When Can Special Needs Adults Understand the Gospel?” Gene Nabi states: “Anyone with a disability, however severe, can come into God’s kingdom. They can be as receptive to the working of the Holy Spirit as anyone else. To question whether anyone has the capacity to come into the kingdom questions the power of the Holy Spirit.” Since differently abled individuals are given the capacity to come into the kingdom (created and called by God and able to respond to God’s calling—Genesis 1:26, Ephesians 2:10), how much more we should embrace that they too should also minister for the kingdom (specially gifted and invited to participate in ministry by God—1 Corinthians 12:4, 7). The black church too often offers two options for those with disabilities: miraculous healing or heroic suffering. Neither of these options are acceptable to people with disabilities. According to the Scriptures, the church’s role is to promote wholeness and abundant life. Wholeness does not always mean that disability or illness will be removed from our midst. When people are accepted as they are, they are empowered to move toward wholeness. The healing ministry of Jesus was concerned with the whole person: body, mind, and spirit. This meaning has been obscured wherever persons with disabilities become “victims” of healing rather than persons whose lives are healed. As you plan for this Disability Awareness Day, consider strategies that will enable people to feel included as they participate in worship each week, rather than only for a particular designated day. Persons with disabilities are wonderful ministers to others; they are solely to be the recipients of ministry only. Use this day to launch a new or expanded disability ministry and to provide information to both your congregation and the community on your inclusive worship opportunities. Expand your Sign Interpretation Ministry to a Disability Ministry and look for opportunities to address other disabilities. Conduct a basic assessment of your church’s accessibility or bring in a consultant for a full and formal assessment. Make sure Church members know it is unlawful to discriminate against disabled people. Train pastor, elders, ministry leaders, and church staff on disability awareness. Many of the people in our congregations are elderly and may have developed disabilities, particularly physical or sensory impairments. As the age of a congregation increases, so does the incidence of disability. Therefore, we need to be aware of people’s needs on an on-going basis. Review church activities regularly to make sure they are accessible to disabled people. Review your church website to consider its accessibility. When planning worship, consider the abilities and disabilities of all those you are hoping to include. Include persons with disabilities as liturgists, ushers, communion servers, and preachers—all the ways people who are able-bodied share their gifts with the church. Ask people with disabilities how they want to participate in the sacramental celebrations of the church. Don’t presume to know or make decisions on their behalf. Develop an awareness of the forms and amount of physical movement involved in worship. Consider the amount of time that is spent standing, kneeling, and sitting in worship. The flow among these movements may seem appropriate, but for some people—whether temporarily able-bodied or disabled—too much time may be spent in one of these postures. Solicit and be receptive to feedback. Help create worship services and space that welcome diverse forms of physical participation. Communicate clearly, both in attitude and in print, that anyone may choose not to participate in any action on the basis of comfort or conscience. Provide some general guidelines to your greeters and ushers on how to interact with persons with various disabilities including hearing impairment, speech impairment, mobility impairment, learning disabilities, and other disabilities. Encourage the use of multiple cues in worship. Combine simple printed directions in the bulletin with oral and physical cues that facilitate the participation of all people in worship. For example, when the congregation should stand, a simple indication in the bulletin combined with the verbal cue “Please rise as you are able,” and the physical cue of raising one’s arms effectively provide multiple cues to the congregation. People with an intellectual disability tend to learn more easily by using their senses of sight, touch, smell, and taste, rather than listening to words. Active learning is more effective than passive learning. The use of physical and visual props is very effective. Therefore, the use of drama, mime, music, and visual effects is very effective when including people with intellectual disabilities in worship, and in fact for the inclusion of all people. Mobility and access will be the two crucial issues for the inclusion of people with a physical disability. Once the person is in the building, assist him or her to an appropriate place to sit. Ask what his or her preference is for seating. It is often helpful to position a wheelchair within the body of the congregation, rather than in an isolated position. A person with a walking frame/stick will probably be more comfortable at the end of a row so that access is more readily obtained. Ask the person where he or she wishes to be seated. The position of lighting may be important. The provision of large-print hymn books, orders of service, and well-lit and positioned hymn number boards and screens is important for those with little or no vision. It is important to have someone to accompany the person so that a commentary can be given of aspects of the service that are not auditory. A clear amplification system that doesn’t distort the spoken word is essential. Speakers need to speak distinctly, not too quickly, and should always face the congregation. A hearing loop facility is also necessary. Visual cues should be matched with the spoken word where possible. These include: hymn number boards, designation of readings, and printed orders of service. Gestures and facial expressions of worship leaders are also important. We come with different abilities of mind, body, and spirit. When God made us, he looked around and saw that it was good. It is good because our Creator has invited us all to participate in ministry. Now look around and see the goodness of God in all persons! Let us all celebrate the goodness of God! Leader: Lord, you have taught us that we are all created in your image; we are all gifted and called by you, and are all invited to participate in your ministry. Today we pray for those who are sick with debilitating conditions… and for those who have good health but are not thankful and are poor stewards of your temple. We pray for those who have limited or no vision…and for those whose eyes can see those in distress but look away. participate in your ministry. Everybody belongs. Everybody serves. whose mouths are full of hurtful words and judgment instead of kindness, encouragement, love, and understanding. We pray for those whose minds work differently than ours or whose emotions are disturbed…and for those who close their minds and cannot seem to care for anyone who is different than they are. We pray for those who are deaf or cannot hear well…and for those whose ears refuse to listen to others. We pray for those who have limited or no mobility of their limbs…and for those whose arms should embrace and serve those in need yet do not have the compassion to reach out. participate in your ministry. Lord, speak to us today and change our hearts that we may have love for all and that our church becomes a place where everybody belongs and everybody serves. According to your will and to your glory. Amen. (a)	I Have a Right to Praise Him. By Luke Mercer, Jr.
(a)	O Christ, Your Heart, Compassionate. By Herman G. Stuempfle, Jr. Tune, (ELLECOMBE), Setting by Stephen P. Folkemer. This selection is for SATB, Organ and Trumpet in C.
(b)	Let Us Love. By Mary McDonald. This selection is for SATB with keyboard and optional strings. (a) Disability Resources.org. This non-profit organization was established to improve disability awareness and to promote the availability of disability-related information. They provide a list of web sites that offer information designed to encourage and support the accessibility of religious organizations and facilities. Photograph first appeared in the article “Worshippers with Disabilities Struggle to Find Home in Church Pews,” by Dionne Walker, The Associated Press. 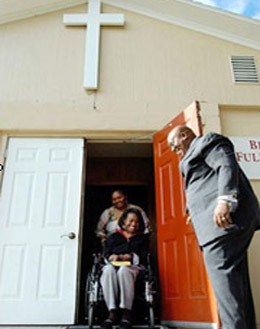 Pastor A. C. Edwards holds the door for church member Shawana Bulloch (center) and her friend Sharai Reed after a church service at the Believers in the Word Full Gospel Ministries in Savannah, Georgia. Bulloch recently convinced her congregation to get a portable ramp that allows her wheelchair access to the church. Online location: http://www.joplinglobe.com/weekend/local_story_015101258.html?start:int=15 24 January 2010. “Gospel Accountability: When Can Special Needs Adults Understand the Gospel?” By Gene Nabi. Online location: http://www.lifeway.com/article/?id=168109 18 January 2010. Crossroads Christian Fellowship NSW Inc. Online location: http://www.crossroadsfellowship.org.au/nsw/inclSunday.html 22 January, 2010. National Council of Churches USA. Online location: http://www.ncccusa.org/nmu/mce/dis/ 22 January 2010. Clark-Sheard, Karen. The Heavens Are Telling. New York, NY: Elektra Entertainment, 2003. Caesar, Shirley. A City Called Heaven. Nashville, TN: Light Records, 2009. Hurd, Stephen. My Destiny—I Know Why I’m Here. New York, NY: Integrity Gospel, 2006. The Best of Donald Lawrence & The Tri-City Singers: Restoring the Years. Chicago, IL: Chordant, 2003. Phipps, Wintley. “Just as I Am” and Other Favorite Hymns of Billy Graham. Grand Rapids, MI: Discovery House, 2005. (e)	Blessed Assurance. Text by Fannie J. Crosby. Tune, (ASSURANCE), by Phoebe F.
The Blind Boys of Alabama. Down in New Orleans. New York, NY: Direct Holdings, 2009. Unity Praise Ensemble. …O Happy Day—EP. Nashville, TN: Pat Patrick Music, 2007. The Blind Boys of Alabama. The Best of the Blind Boys of Alabama & Clarence Fountain. Orlando, FL: Fuel Records, 2007. (a) I Have a Right to Praise Him. By Luke Mercer, Jr. Various Artists/Windsor Village UMC Mass Choir. Lift Every Voice…In Praise. Brentwood, TN: EMI Gospel, 2004. Hayes, Dr. Charles G. & The Warriors. The Remix. Chicago, IL: ICEE Inspirational, 2006. Voices of Citadel. Won’t It Be Wonderful. Brooklyn, NY: Music Blend Records, 2009. The Brooklyn Tabernacle Choir. Declare Your Name (Live Worship). New York, NY: Brooklyn Tabernacle Church, 2009. The Essential John P. Kee. New York, NY: Verity, 2007. Gospel Music Workshop of America. Live in Kansas City 2004. New York, NY: Artemis, 2005. Mississippi Mass Choir. Mississippi Mass Choir: Greatest Hits. Jackson, MS: Malaco, 1995. Wright, Timothy & The New York Fellowship Mass Choir. Live in New York. Atlanta, GA: Atlanta International Records, 2003. Gaither Vocal Band. The Best of the Gaither Vocal Band. Alexandria, IN: Spring House Music, 2004. Hawkins, Walter & The Hawkins Family. Take Courage. Los Angeles, CA: Bellmark, 2000. Various Artists/Woman Thou Art Loosed Worship Team. Lift Every Voice…In Worship. Brentwood, TN: EMI Gospel, 2006. Invitation to Worship. New York, NY: Zomba Gospel, 2005. One Church. New York, NY: Zomba Gospel, 2005. Sapp, Marvin. Thirsty. New York, NY: Verity, 2007. My Everything. New York, NY: Reunion Records, 2002. No One Else. New York, NY: Zomba Gospel, 1997. Just the Beginning. New York, NY: Zomba, 2008. Worship for the Kingdom. Brentwood, TN: EMI Gospel/Alliant, 2007. Beauty for Ashes. Whitefish, MT: Metro1 Music, 1996. Brown Clark, Maurette. By His Grace. Atlanta, GA: Atlanta International Records, 2002. Murphy, William H., III. All Day. New York, NY: Sony BMG Music Entertainment, 2005. Niyoki. Rest. Nashville, TN: EMG, 2008. Sheard, Kierra Kiki. Double Take—Kierra Kiki Sheard. Brentwood, TN: EMI, 2006. St. John’s Children Choir. Dear God, Hear Us Sing (100 Bible Songs for Kids). Montreal, Quebec: Madacy, 2008. Hillsong Kids. Super Strong God (Live). Australia: Hillsong Australia, 2005. Veggie Tales (Veggie Tunes). VeggieTales Worship Songs. Franklin, TN: Big Idea Records, 2006. Veggie Tales (Veggie Tunes). Here I Am to Worship. Franklin, TN: Big Idea Records, 2009. (b) Let Us Love. By Mary McDonald. This selection is for SATB with keyboard and optional strings. Fortune, James & FIYA. The Transformation. New York, NY: Worldwide Music, 2008. Houghton, Israel. A Deeper Level (Live). New York, NY: Integrity/Columbia, 2007. Phillips, Craig & Dean. Let the Worshippers Arise. New York, NY: Sony, 2004. Cage, Byron. Faithful to Believe. New York, NY: Gospocentric, 2009. Whalum, Kirk. Gospel According to Jazz: Chapter II. New York, NY: Warner, 2002. McDaniel, Eric & TLC Cathedral Choir. Restoration. New York, NY: Gospel Fabulous, 2007. Inside Out. Virginia: Tyrone Powell, 2007. Nelson, Jonathan. Right Now Praise. New York, NY: Integrity Media, 2008. The Fight of My Life. Inglewood, CA: Gospocentric, 2007. Faces. Huntsville, AL: Urban Junction East Music, 2008. Phipps, Wintley. No Need to Fear. Grand Rapids, MI: Discovery House Music, 2007. Just Love. New York, NY: Spirit Rising Music/Music World Productions, 2008. Place of Worship. Baltimore, MD: Jaelyn Songs, 2008. Jones-Moffett, Sheri. Renewed. Brentwood, TN: EMI Gospel, 2009. Hawkins, Tramaine. I Never Lost My Praise (Live). Inglewood, CA: Gospocentric, 2007. Together in Worship. Indianapolis, IN: Tyscot Records, 2007. Murphy, William H., III. All Day. New York, NY: Sony Music Distribution, 2005. Cage, Byron. Faithful to Believe. New York, NY: Verity, 2009. Howard, John Jr. and the End Time Levites. The End Result. Atlantic City, NJ: ETL Music, 2007. Songbook of Micah. Brentwood, TN: EMI Gospel/Dexterity Sounds, 2005. The Soul Stirrers. A Soul Stirring Reunion. Jackson, MS: Malaco, 2008. Burrell, Kim. No Ways Tired. Newton, NJ: Shanachie Entertainment, 2009. Promises. Indianapolis, IN: Tyscott Records, 2007. Ladysmith Black Mambazo Journey of Dreams. New York, NY: Rhino Entertainment, 2005. The Murrills. Family Prayer. New York, NY: Verity, 2008.